But the Wall Street firm is still bullish overall. In case you haven't heard by now, Facebook (NASDAQ:FB) has had a terrible year. The largest social networking company has faced a never-ending string of scandals around data practices and privacy, which have led to elevated risks and contributed to a steady deterioration of user trust. Shares have lost over 40% of their value after peaking in the summer, and are now trading near 52-week lows. However, many analysts remain mostly bullish -- RBC Capital recently named Facebook one of its top internet picks for 2019, for instance -- since the scandals haven't meaningfully impacted user metrics and advertisers aren't going anywhere. But the Street still needs to accommodate for all of the revelations. Mark Zuckerberg speaking at F8 2018. Image source: Facebook. Needham is the latest to tweak its estimates, with analyst Laura Martin cutting her price target on Facebook shares from $215 to $170, while maintaining an overall buy rating. Despite the bullish rating, Martin has numerous concerns about the risks that Facebook is facing, particularly the potential that lawmakers and regulators around the world will seek to exercise more oversight in the wake of the scandals. Facebook will likely also have to start paying greater taxes in Europe at a time when the European Union is expected to see slowing macroeconomic growth. The French government is preparing to implement new taxes on U.S. tech giants at the start of the new year, for instance, with other European countries expected to follow suit shortly thereafter. Many tech companies have been able to skirt and/or minimize taxes around the world due to the digital nature of some of their businesses. "The tax will be introduced no matter what on Jan. 1, and it will be for the whole of 2019," French Finance Minister Bruno Le Maire said earlier this week. Facebook CFO Dave Wehner also warned in July that revenue growth will continue to decelerate while costs rise as Facebook invests heavily in platform health. 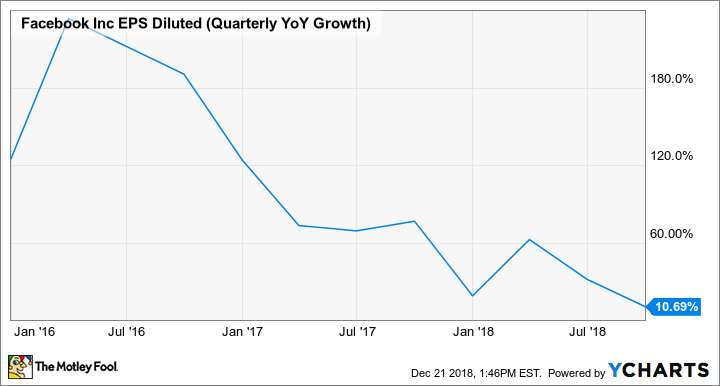 Expense growth is expected to outpace revenue growth in 2019, according to Wehner. Martin expects those margin pressures to remain for the foreseeable future, and believes earnings per share in 2020 will rise just 7% from 2019 levels. The days of blistering profit growth could be in the rearview mirror. FB EPS Diluted (Quarterly YoY Growth) data by YCharts. On the bright side, Martin thinks Facebook is still "the least expensive way to participate in several inexorable long-term trends," and believes the company has some opportunities to ramp up monetization of WhatsApp and Messenger. The social networking giant only recently turned on WhatsApp monetization, with its primary strategy currently being connecting businesses to consumers. Those efforts are just beginning, although WhatsApp isn't immune to controversies of its own.